I just wanted to jump in for a second and say that I finally wrangled a few minutes of action out of my brain and started a new knitting project (actually two, but the other I have to quickly finish before I can get a picture). You will all be glad to know that also, at this very moment, my bathroom is clean. We have not sacrificed everything for the Easter tree! I am hopeful that I may manage a few minutes of sewing time tomorrow (I don’t know why I am hopeful – we have had to admit that the twins are just not napping anymore. No, wait! I know why I am hopeful – the bathroom is clean! ), and maybe that will result in some finished Easter dresses. We will see how it all pans out in the morning! But, in the meantime, if you want to crank out some Easter eggs with some scraps of yarn that you had around, these take hardly any time, and they are pretty cheerful if I do say so myself! Oh- so sweet! How I wish I knew how to knit! oh boy. a clean bathroom provides much hope. I need a clean bathroom. I know what I’m doing this afternoon! But first, I am tackling the dishes and the dirty floors. Oh, please post pics of the Easter dresses! When they are done of course:o)! I was thinking the same thing! I want to see the dresses! I loved that: “…wrangled a few minutes of action out of my brain…” It helps to have a sense of humor about it! About those twins not napping: (Maybe you already do this.) In our early years of teaching our kids at home, I read the idea of Quiet Time. No one speaks for one full hour in the afternoon. Sign language and similar gesturing is also not allowed. The bairns learned to sit in the crib with a stack of books and a stuffy. It was fabulous. Even the kids got to where they loved quiet time, too. You ladies inspire me to be creative. 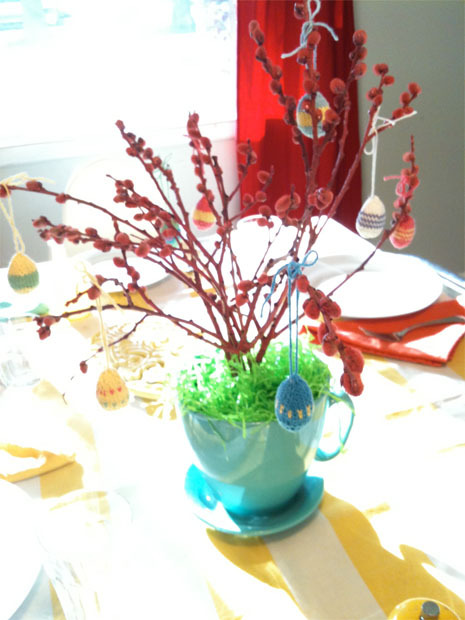 I loved both the eggs and the chicks, and would love to make them for a spring decoration. But here in the southern hemisphere, Easter is an autumn event, and about the time we start cosying down for the cooler months. Hot chocolates, hot cross buns and chocolate lambs to remember the Lamb of God who takes away the sin of the world. Oh – and a good old Aussie roast lamb dinner on Good Friday. God is good.